Short and long-term Pemba Hotel accommodation is available at The Nautilus in 21 newly-renovated beach bungalows- each set amongst shady trees, just paces away from the gentle shoreline. 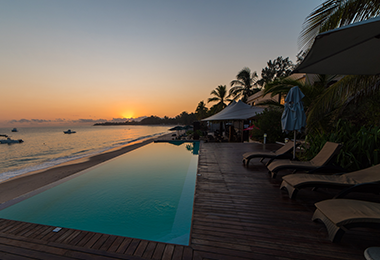 This well-appointed oceanfront hotel offers guests an opportunity to experience the tranquility and beauty that makes Mozambique the sought-after location it is today. Interlinked with wooden walkways, the bungalows are complete with two bedrooms, a spacious lounge, and one bathroom and shower. The double, and single beds offer a comfortable respite after a long day of sightseeing, business meetings or conferencing. 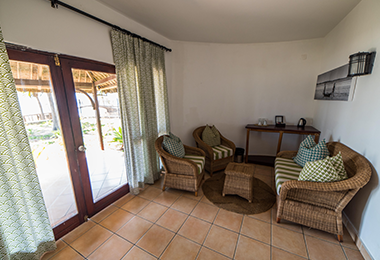 Each bungalow boasts double doors that open onto a quaint, covered veranda, allowing fresh sea air into the comfortable living space. The veranda is complete with ample outside furniture, so after a long day exploring the Pemba shoreline, guests are able to recline with a refreshing drink without having to venture too far. 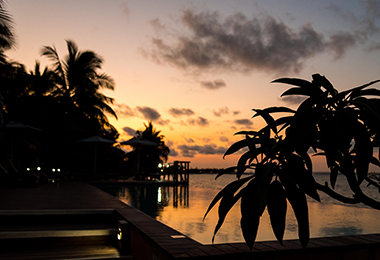 One of the best places to watch the famous Mozambican sunset, The Nautilus is designed for quiet evenings spent with stunning views of the Indian ocean. The free-standing bungalows ensure an intimate and private getaway, and a much needed break from the bustling crowds. 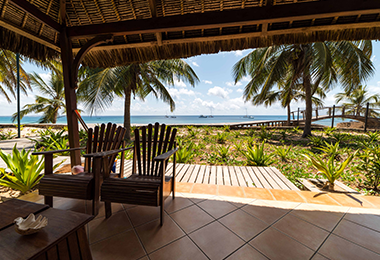 A color palette of natural, earth tones is used throughout the property, and, coupled with the use of wicker furniture and thatch roofing, create the true atmosphere of a beach paradise. 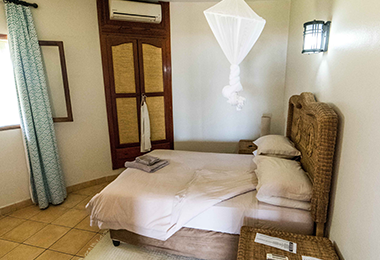 The decor and fittings are rich with Makonde tradition, allowing Nautilus to embody an authentic Mozambican spirit in each aspect of this dynamic property. The lounge area has a bar fridge, and tea and coffee making facilities. Mini-bar facilities are available on request. In addition to the facilities within the bungalow, guests can relax on the central sundeck of this wonderful Pemba Hotel accommodation, or cool off in the fresh-water rim-flow pool. 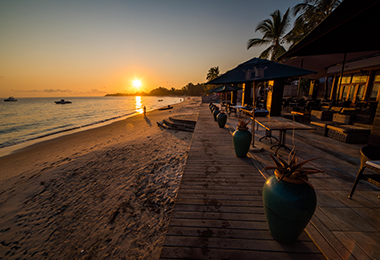 The Dhow Restaurant, serving up traditional Mozambican fare, as well as a convivial beach-side bar, completes the picture. The contemporary Dhow restaurant and bar on site offers a full menu on a daily basis and is open for the breakfast, lunch and dinner.